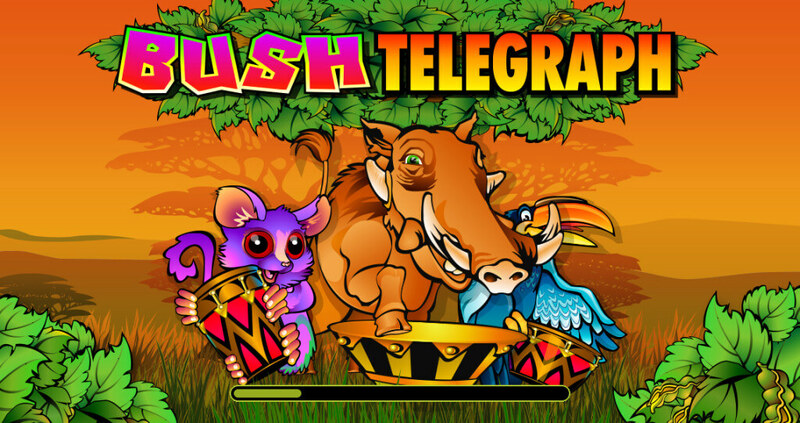 Bush Telegraph is a 5 reels and 15 pay-lines HTML5 platform mobile pokies designed by game giants, Microgaming. This mobile pokies is compatible with Android devices, iOS, smartphones and tablets. It also features a few special bonuses and benefits which players will enjoy. Its symbols on the reels include bongo drums, bush, seed-pots and standard playing cards Ace, King, Ten, Queen and Jack. Bush Telegraph offers more than an enticing theme. It has charming game symbols with exceptional features at their finest. The Wild symbol serves as the highest paying symbol, the Scatter wins reward wins of up to 400 times total bet. Things get more exciting when you trigger the Bongo Bonus game or Free Spins feature. The mobile version layout differs from the desktop one and things are not crowded in the options panel. With mobile version, below the game screen you will only find four fields which are; Bet, Credits, Spin and Win. Maximum 15 pay-lines are automatically selected and cannot be changed while coin denominations available range from $0.01 up until $1. Players can bet up to 5 coins per pay-line or 75 coins per spin on the reels. Game quick spin and sounds option can be enabled or disabled using the buttons below the reels. The Game Logo acts as the Wild Symbol and substitutes all other symbols except for the scatter and Bongo Bonus symbols. When five Wild symbols appear on the reels, you will walk away with 7 500 coins jackpot. The Scatter symbol is the Seed-pot symbol and rewards you with free spins when three, four or five of them appear anywhere on the reels. Bush Telegraph pays good money and high-value special features in the base game. Although this game does not have a progressive jackpot, when five Bush Wilds appear on an active pay-line, you will be rewarded with a whopping jackpot of 37 500 credits which is enough to compensate the fact that there’s no progressive jackpot. The Bongo Bonus Game is activated when three or more Bongo Drums appear on an active pay-line. Players can win an instant credit prize of between 36 and 2 500 coins when they choose three bongo drums from the hidden symbols. When three or more Seed-pots Scatters appear anywhere on the reels, players get a reward of 10 free games where all the wins are multiplied by three. Players also get a chance to win an instant prize of 2x, 4x, 50x and 400x total bet for two or more scatters on the screen. Bush Telegraph pokies is compatible with iOS, smartphones, tablets and Android devices. You can play it on the go and have fun while earning money. This pokies pays good money during the base game and it is more likely to attract high rollers with a whopping jackpot of 37 500 credits when five Bush Wilds appear on an active pay-line.